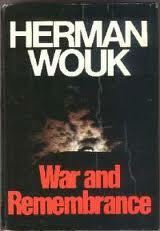 I finished Herman Wouk‘s “War and Remembrance,” a fictionalized but authentic novel of World War II, last night. The book left me overwhelmed and exhausted, and wanting urgently to pin down the most important of Herman Wouk’s keen insights into human folly and war. Quite an accomplishment, for an author to cover the entire, bloody history of World War II — the ultimate manmade catastrophe — to bring some order out of the chaos, and write down the story for an ordinary reader like me to understand. “War and Remembrance,” published in 1978, is a 1,042-page account of World War II, in all it’s horror, from the U.S. declarations of war on Germany and Japan at the end of 1941 — after the attack on Pearl Harbor — to Hiroshima in 1945. A prologue, “Winds of War,” a mere 750 pages, published in 1971, sets the economic, military and diplomatic events of the years leading to Pearl Harbor. 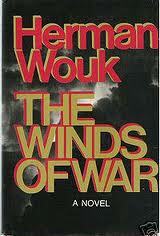 The two books together constitute a masterpiece of historical fiction, the result of Mr. Wouk’s work from 1962 to 1978. I’d read Winds of War before, in about 1974, at the end of the Vietnam era, and I must have read War and Remembrance (though my memory of it is foggy) probably in the early 1980s, the Ronald Reagan era. My mind in those earlier days focused on the eventful lives of the books’ many characters, and the sensation of the battles. “These two linked novels tend to one conclusion: that war is an old habit of thought, an old frame of mind, an old political technique, that must now pass as human sacrifice and human slavery have passed. I have faith that the human spirit will prove equal to the long heavy task of ending war. Against the pessimistic mood of our time, I think that the human spirit — for all its dark side that I here portray — is in essence heroic. The adventures narrated in this romance aim to show that essence in action. Rereading the novels this winter, in the current era of worldwide financial instability, and now a wave of revolution in North Africa and the Middle East, I couldn’t help but think that humankind has failed to learn anything from the catastrophe of the last century. It is painfully clear that we’ve made little or no progress in reforming human government, overcoming economic greed, or renouncing military conquest. Corruption seems to be a growing cancer in all our institutions — especially governments and corporations. 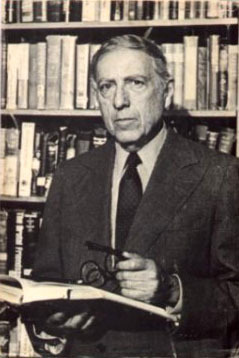 With the U.S. embroiled in three wars — Afghanistan, Iraq, Libya — I wonder what Herman Wouk must think of our present militaristic arrogance. Mr. Wouk, born in 1915, lives now in Palm Springs, Calif. His wife and literary agent, Betty Sarah Wouk, passed away earlier this month, on March 17, 2011, after suffering a stroke. Mrs. Wouk was 90. Herman and Betty Sarah Wouk married in 1945. This entry was posted in Books, History and tagged Herman Wouk, War, War And Remembrance, Winds of War, World War II by Editor (Retired). Bookmark the permalink. HI John, yes I wonder just how far the Human Race has progressed since he published that book… not far! it seems… We are still hell-bent on destroying ourselves by every possible means.. IF we don’t Kill each other with bombs, drugs, weapons, chemicals, and nuclear fall-out we kill ourselves with pollution, as we kill the very earth that sustains us by polluting her oceans, waterways, and Air. Yep, war is certainly not our only concern. Just the other day I heard about a new antibiotic-resistant infection that may spread. Or not. I wonder if that was Man-Made as well?